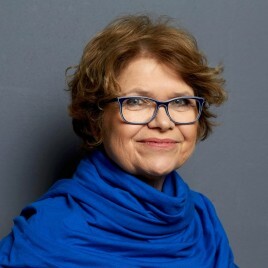 (born in 1954) – journalist, reporter and writer, psychologist by education, doctor honoris causa of the University of Göteborg (awarded in 2017). She worked at Tygodnik Mazowsze, an underground Solidarity magazine, and later co-created Gazeta Wyborcza, with which she is associated to this day. Author of more than a dozen books, including Pamiątkowe rupiecie, przyjaciele i sny Wisławy Szymborskiej (1997, together with Joanna Szczęsna), Lawina i kamienie. Pisarze wobec komunizmu (2006, also with Joanna Szczęsna), for which she received the Culture Foundation Grand Prize. In 2012, she published her famous book My z Jedwabnego, for which she received the Polityka magazine historical award and the European Book Prize, and its American edition was listed among the 100 most important books of 2016 according to the New York Times and received the National Jewish Book Award. In 2017, she published Sendlerowa. W ukryciu – a biography of Irena Sendlerowa, for which she won the Ryszard Kapuściński Award, as well as the Poznań Literary Award; she was also nominated for the Nike Literary Award. Winner of the 11th Literary Award of the Capital City of Warsaw.